I’ve been wanting to bring up this topic for quite some time. It’s another one of those things which were hot in the seventies and eighties, but which we have supposedly outgrown with our progress into the third wave – and which I think we are nowhere near done talking about. The prompt I needed was being informed by one of the inspirational writers’ blogs I follow, that Saturday, 2 February, was Ayn Rand’s birthday. It was an inspirational prompt – but only in the sense that it inspired me to type up another angry blog post. Recently, one of my favourite feminist forums posted an apology for having put an Ayn Rand quote on their newsfeed: someone had unwittingly cited her, without knowing what sort of a person/writer she was, and assumed she made a good example for ambitious female writers. This particular delusion is wide-spread, and it saddens me, the same way that it drives me up the wall to her Jane Eyre referred to as a proto-feminist icon, or Margaret Thatcher as an example to ambitious women everywhere. If these are the sort of women we are being advised to look to even by those who purport to help and advise us, women’s emancipation is still slow in coming. Just because a person is a woman and successful does necessarily make her a role model for other women. For a piece of happy feminist news recently, you can’t beat Sandra M. Gilbert and Susan Gubar receiving a life-time achievement award from the National Book Critics Circle. 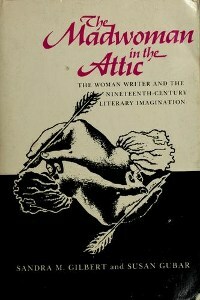 Everybody knows that this is really a belated canonical recognition for the set text for teaching women’s literature, The Madwoman in the Attic. Published in 1979, it is still a ground-breaking effort, and is still instrumental in changing the way most readers view the English-language literary canon. It is as good an occasion as any to reconsider the matter brought forward by Virginia Woolf with regard to Shakespeare’s sister: the experience of women in writing, as authors and as characters. The admiration for such as Ayn Rand amongst female writers seems, to me, indicative of a continued lack of literary foremothers. My particular interest is in the same canonical works discussed by Gilbert and Gubar, and I cannot fathom why it is so common to prefer Jane Eyre as a strong female character to Shirley, why the love story of North and South is more appealing than the daily cares of the ladies of Cranford. The former belong to a literary tradition still embraced by publishers as a selling point, whereas the latter have been allowed to slide into popular canonical obscurity. It is still difficult to conceive of the excitement and tensions in a novel focused only on elderly spinsters. Margot Magowan addresses the same question when she examines the gender biases of children’s films released in 2012: the trend still decrees that a girl can only be a protagonist in a girl’s film; her very girlhood becomes an insurmountable character trait, because we assume the male to be the default. This, then, is what we are aiming for: for women to attain the same scale of output and achievement, literary and otherwise, as men, if only so that other women can choose their own role models because they are admirable, and not merely because they are women who have achieved something. Of course female achievement should be recognised in the context of the patriarchal hierarchy, but if Ayn Rand and Margaret Thatcher have struck blows for women’s advancement, their brand of feminism is certainly not mine.